Salt is present in all our body fluids though there is more in the blood and fluid outside the cells than inside. The function of salt is to maintain all body fluids at an optimum level. The body loses salt in the urine and sweat, which is why. Sodium is present in most everything we eat. Fruits, herbs and flour contain the lowest amount. Some of them, such as apples, are so low that we don't count their sodium content. Sodium is high in baking powder, baking soda, soy sauce, cheeses and other food and cooking additives. Salt is not sodium, but it does have a lot of sodium in it. Table salt is made up of 40% sodium and 60% chloride. Commercially produced table salt has 2,350 mg sodium per teaspoon. Sea salt's sodium count is nearly as high with 2,132mg per teaspoon. Salt is not always necessary in cooking. It is most often used as a preservative. The average salt intake in the UK is between 9 and 12 g per day. Current recommendations are to reduce salt intake to 6 g per day or less. 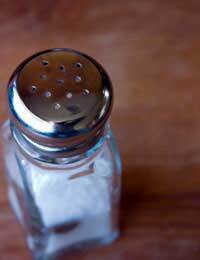 Is Sodium Essential For Your Health? Although some sodium is essential for your health, inadequate sodium intake is rare. We need less than 500 milligrams a day to stay healthy. A more common problem is a dietary intake of excessive amounts of sodium. Excessive sodium intake can cause fluid to be retained in the body tissues which can lead to high blood pressure, and can aggravate congestive heart disorders, certain forms of kidney disease and premenstrual syndrome. The best way to reduce sodium levels is to avoid or limit salt when you are cooking or dining and avoid processed food products, which often contains excessive amounts of sodium. Baking Soda or Sodium Bicarbonate (821 mg to 980 mg per teaspoon) is generally used to leaven breads and cake, added to vegetables in cooking and often included in antacids. There is currently no substitute on the market. Baking Powder (320 to 480mg per teaspoon) is used mostly to leaven quick breads and cakes. Sometimes a mixture of cream of tartar and cornstarch will help replace baking powder. MSG, Monosodium Glutamate is dangerous for people suffering from asthma or migraine headaches, hypertension or have heart disease, or other high blood pressure maladies. It is often found in packaged, canned and frozen foods. Disodium Phosphate (also Sodium Phosphate) is used in processed cheese and some quick cooking cereals. Sodium Alginate is used in many chocolate milks and ice creams to attain a smooth mixture. Sodium Benzoate is generally used as a preservative for condiments such as sauces, salad dressings and relishes. Sodium Citrate is an antioxidant present in baking soda. Sodium Hydroxide is a food processor that softens and loosens skins of certain fruits, vegetables and ripe olives. Sodium Nitrate/Nitrite. Use of this has been linked to some forms of cancer; it is used to cure meats including sausages, used in luncheon meats, hot dogs and other deli items. Sodium Propionate is used in breads, cakes and pasteurized cheese to inhibit mould growth. Sodium Sulphite is used to bleach maraschino cherries and to glaze or crystallize fruits. Used as a preservative in some dried fruit such as apricots, prunes and pears.